These little muffins are so quick and easy to make and are an ideal way to make lunchtime a bit more exciting. They have so much flavour for so little points and so provide a real sense of satisfaction when you’ve gobbled them up. The recipe I’ve created below is delicious but its also easily adapted so throw anything you fancy into your mixture (I’ve done chorizo and paprika, smoked salmon and chive and ham and mushroom too!). You can even pop in some breakfast ingredients to make a lovely quick brekkie or even have them as a snack on the go! Pre heat your oven to 180c. Take your spinach and either wilt it in a pan of boiling water or steam (I just used a metal colander over a pan of boiling water and steamed for around 7 minutes). Fry off your mushrooms in 1kal for a minute or two. Meanwhile beat your eggs and egg whites together, then add the feta, mushrooms, nutmeg and salt and pepper and beat well together. 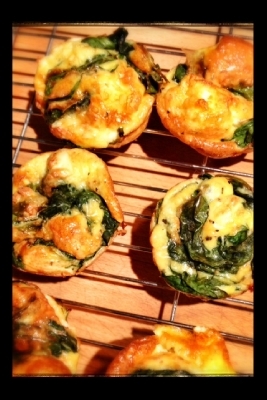 Take a muffin tin, spray with 1kal and share your spinach between 9 of the muffin rounds. Next pour the egg mixture over the spinach until the muffin tins are around ¾ of the way full. Top each with grated cheddar and pop in the oven for around 20 minutes! Eat warm from the oven or store in an air tight container in the fridge. Pop in the microwave for a minute before you eat if you fancy it warm. Serve on a bed of salad leaves, chop up a few cherry tomatoes and drizzle over a little balsamic vinegar!